Clair Nicholas at The Snags. Lake Tahoe has over 1100 documented boulder problems and more are discovered ever week. Below are some of the best areas through North Lake Tahoe, South Lake Tahoe, and surrounding areas. 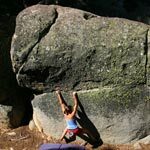 Learn general info on the South Lake Tahoe climbing area  where to stay, how to get there, maps, etc..
Kevin Swift on the Birthday Boulder. White Lines ascends the middle of the boulder. Darrell Gschwendtner on Problem 8’s splitter finger crack. Chris McNamara on problem 37.